And there's a colour-coded discount for Mother's Day, too. 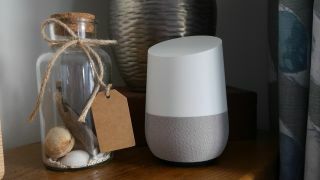 US Google Home owners have been able to enjoy the feature for a while, and now finally those using Google's smart speaker in the UK can make use of the system's hands-free voice calling option. All it takes is the name of the pal or business you're looking to call, a shout of "hey Google" or "OK Google" followed by the call recipient's name to get connected. You just have to make sure the person you're looking to connect to is in your Google Contacts address book, and the call will be placed over Wi-Fi. Calls show up initially however as unrecognised or private numbers on the recipients handset, which is worth noting, though you can teach Google Home to understand six different users – meaning six different flatmates, with six different mums, could place a call with their voices and each get the right number dialled. Speaking of mums, Google is also knocking £10 off the coral-coloured version of the Google Home Mini speaker in time for Mother's Day, dropping the price to £39. Originally a Google Store exclusive, the speaker shade can now also be picked up at Currys PC World, Argos, John Lewis and the not-long-for-this-world Maplin, too.